Cerebral palsy, a group of disorders that affect the brain and nervous system, is taking a huge toll on Chinese society, experts say, and families with CP patients are in desperate need of help. That was the consensus during the opening ceremony of a campaign held in Beijing on Dec 12 to raise social awareness about the disease. The campaign was initiated by One Foundation, China Philanthropy Research Institute of Beijing Normal University, and other nonprofits. The groups made an appeal for social-welfare legislation that would help families coping with cerebral palsy. Caused by damage to the motor-control centers of the developing brain, the condition can occur during pregnancy, delivery, and in small children under 3. It will severely damage a patient's social function if not diagnosed and treated early. China is estimated to have about 6 million cerebral-palsy patients, including up to 1.2 million children under 6, according to the campaign organizers. About 70 percent of these children live in remote and poverty-stricken areas, meaning they have little access to treatment and rehabilitation training, and are easy targets of social stigma, experts say. Treatment and rehabilitation are very expensive - up to 10,000 yuan (about $1,600) a month in China - and are often excluded from medical insurance coverage, according to Shang Xiaoyuan, a social development and public policy researcher with Beijing Normal University. Studies show that a patient with the disease will cost the family at least more than 500,000 yuan in treatment in his or her lifetime. In addition, the main care-givers or guardians often have to devote most of their time to taking care of children with cerebral palsy, and may sometimes have to quit their jobs. This often reduces the family's total income and aggravates its financial burden, according to Chen Hongle, an executive with One Foundation, a charity initiated by celebrity actor Jet Li. Zhang Dakui, 31, says he always feels grateful to his parents and stepmother for his recovery. The doctoral candidate in computer science with the Beijing Institute of Technology developed cerebral palsy after an infection in infancy, and lost almost all ability to walk and talk. His family did not give up on him. Instead, they made great sacrifices to continue his treatment and education. After years of effort, Zhang is now able to work and live much as others do, despite not being able to walk and talk as normal. Zhang never forgot a girl he knew who also had the disease and used to be in a better condition than he was. But with the prospect of recovery dim and treatment costly, her family chose to stop the treatment. Today, she is confined to a trolley, and has to depend totally on others to move her around. "I cannot help feeling sad whenever someone praises me, after they know what I have gone through," Zhang says. Although he is happy to see more charities paying attention to his fellow sufferers and offering help, the majority of patients in China are not as fortunate as he is. They are more likely to share the immobile fate of his friend, Zhang adds. "In the past years, the government and society have made big progress in helping children in need, but there is still much to do," says Yang Peng, the secretary-general of One Foundation. The healthcare system also covers more diseases for children than in the past. The Ministry of Education has also issued regulations to guarantee the quality of special schools for children physically and intellectually challenged. In addition, charitable associations and foundations in China nowadays are better able to help children in need, including children with cerebral palsy. But such help is merely a drop in the ocean, Yang says. 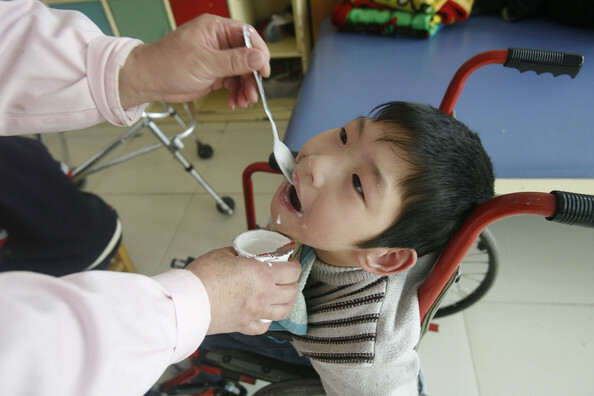 "If the country legislates to guarantee welfare of families with CP children, it will be much more efficient and beneficial to them than the weak support from charities," Yang says.